The second World Showdown of Esports event wrapped up along the shores of Manhattan Beach, California on Friday evening. The Grand Finals of this landmark all-female Hearthstone pro tournament came down to a clash between two Hearthstone casters. Ultimately, Jia Dee came back to overcome Cora "Songbird" Georgiou and win 3-2 to claim the lion's share of the $30,000 prize pool. For the folks at ESP Gaming and WSOE, this two-day tournament has been a success. Following October's Dota 2 tournament, WSOE only hopes to grow bigger from here, with more competitions planned for 2019. To learn more about this week's event, Shacknews spoke to ESP Gaming VP of Marketing Matt Grabowski. Among the topics were this week's all-female Hearthstone tournament, Blizzard's surprise balance patch, and what's next for the WSOE. Shacknews: This is the second World of Showdown Esports event that ESP Gaming has put together. How do you feel this event has improved on the first, especially since it's coming so soon after? Matt Grabowski, ESP Gaming VP of Marketing: I think one of the things that we're committed to at WSOE is constantly improving. And that's everything from our production to the quality of the experience for the players to the innovations that we're introducing in gameplay. And hopefully, if you're a fan who's watched the streams from both events, you'll see that reflected in the way it's presented and the way we talk about our event and the types of content that we're publishing to our social media channels. So it's something that I hope we'll see continually. And obviously, as we get better and better, the improvements will be smaller and smaller, but I hope that every time you watch a WSOE event, you'll see improvement in everything that we do. Shacknews: How did you go about bringing together all of the talent for this show? Not just the competitors, but also the casters and analysts? Grabowski: We're fortunate in that a lot of us have been around gaming and esports for a long time. So one of the things that we were able to do is very quickly access our networks of folks and bring them in to help us out. And through relationships with folks like Blizzard, through personal relationships that we've built up through our careers, we do have access to the very best talent in the business. We're always very pleased to bring them into our productions. Shacknews: You even brought in [UFC ring announcer] Bruce Buffer for this! How were you able to get him to help out with this event? Grabowski: A lot of our production team comes from a more traditional sports production background. So like I said with our relationships in esports and gaming, we also have relationships throughout traditional sports media. Bruce is one of those connections we were fortunate enough to get involved. Shacknews: This tournament fell awfully close to the holidays. Was there a concern that you wouldn't be able to get everyone out here, given everyone's busy schedule and how close it is to Christmas? Grabowski: I think if there's one thing that we pride ourselves on at ESP Gaming and at the WSOE, we feel very strongly that we may be the very best in the business at putting events together in tight timeframes and on budget and on schedule. So I think one of the things that I love about our company is that we have a great "can do" spirit. I won't lie, it was a very tight timeframe, but we have really quality people that work with us. Hopefully, we are going to establish a reputation for making things happen. Shacknews: You're operating without a studio audience. What made you decide on this setting, as opposed to a more crowded environment? Grabowski: One of the businesses that our parent company ESP Gaming is in is white label production. One of the capabilities that's very important to us and stage them in a number of different facilities around the world. For us to operate here, this is demonstrating additional capabilities both for the WSOE and for ESP Gaming. This is such a great facility and I think anyone watching on stream can see that. Certainly those of us who had an opportunity to be at an event here on the site, it's an amazing production facility. We'd love to work here again if we get the opportunity. Shacknews: WSOE prides itself on "multi-genre esports tournaments." Aside from the obvious answer of, "They're all female competitors," how is this particular tournament with its all-female field come across as a different kind of Hearthstone tournament? Grabowski: I think, among other things, we had the changes to the game itself that came out literally the day before the competition. One of the things I think is exciting is the way that we have done the production to accommodate that and bake that into how we're presenting the show and it becomes a part of the story, part of the narrative that we're trying to produce around the event itself. In terms of what makes it a different kind of Hearthstone competition, you see the quality of production, the level of production values, and you see the cold open with Bruce Buffer, the video that we produced here at Manhattan Beach. 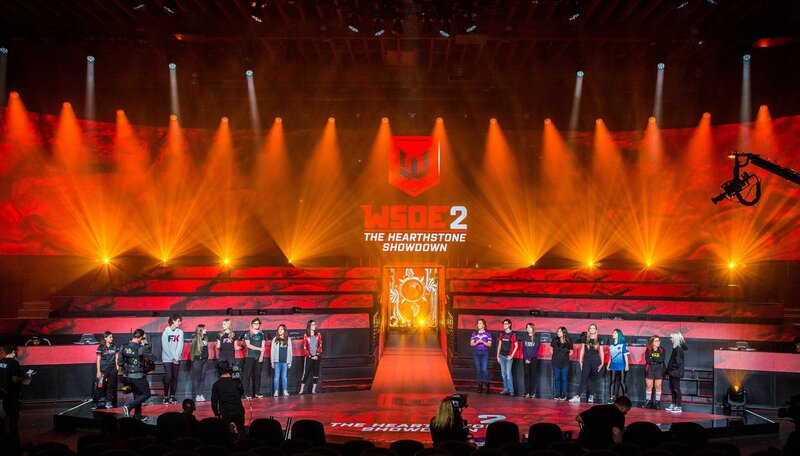 Hopefully, it's being able to raise the level of production on all of those elements that will make this a distinct event and will ultimately help establish WSOE as a top-flight producer, not just for Hearthstone events, but for all esports. Shacknews: You've done Dota 2 and you've done Hearthstone. And you've had them both in the last three months! How often are you looking to hold events? Grabowski: We're looking to do about a monthly cadence of live, numbered WSOE events. What you're seeing right now is that as we establish our presence in different games and different genres, we're doing what we generally call "Showdown" tournaments, with traditional ladder-style brackets. Once we have established champions in each of those games, you're going to see more of what the real WSOE is, which is these fight card-style, curated events, where champions have an opportunity to take on and defend their title against challengers. Shacknews: Lastly, what games are you looking to branch out to for future WSOE events? Grabowski: The events that we've produced include battle royale, with a PUBG event that wasn't an official WSOE event held over the summer; we've done MOBA, with the Dota 2 tournament that you mentioned; we have CCG. We're hoping to branch out into all the top genres. You'll see sports, you'll see fighting. We're excited to announce that we're going to do another battle royale event later this year, in the next week. That's going to be Fortnite. Super stoked about that one. And then, ideally, we'll have champions in all of the major genres and hopefully you'll see all of that by the end of 2019. 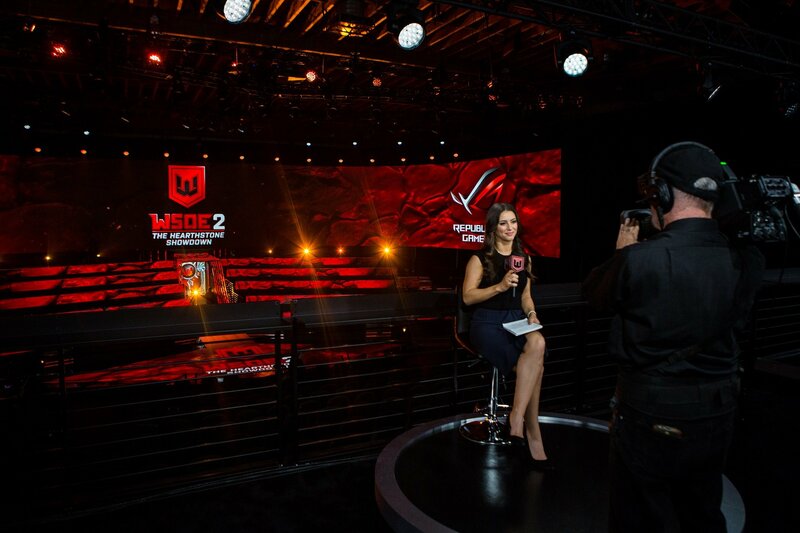 For more on the WSOE, be sure to visit the World Showdown of Esports website.